I was having a hankering for a classic wintry salad, the Waldorf. I gathered together my apples and celery, but oops, no walnuts were on hand. Not a total game changer, but it opened up the possibility of taking the salad in a slightly different direction. Chef Husband brought to my attention that we could add little variety with Asian pears. Next we had a head of iceberg lettuce on hand, which brought the idea of a wedge salad. Then I remembered the pan of bacon we had just baked! First, I prepared a simple Honey Dressing (recipe below) and give it time to meld. Next, I took a couple Fuji Apples and Asian Pears, cored them and cut them into a large-dice sized pieces. As I diced them, to prevent them from browning, I placed them into a bowl of salt water (1 Tbsp kosher salt per 1 qt cold water). Meanwhile, while the apples held in the salt water (for about 10 minutes), I diced up a couple ribs of celery. With the thick-cut bacon already crisped and cooled to room temp, I grabbed my trusty kitchen shears and quickly cut a few slices into bite-size pieces. The last piece of the puzzle was to remove the core and cut the iceberg into wedges. I went with an 1/8th wedge for a smaller side salad. From there it was simply a matter of pulling it all together. First I drained and rinsed the apples and pears (under cold water) and patted them dry with a towel. Then into the bowl they went with the celery and were gently tossed with just enough dressing to coat. 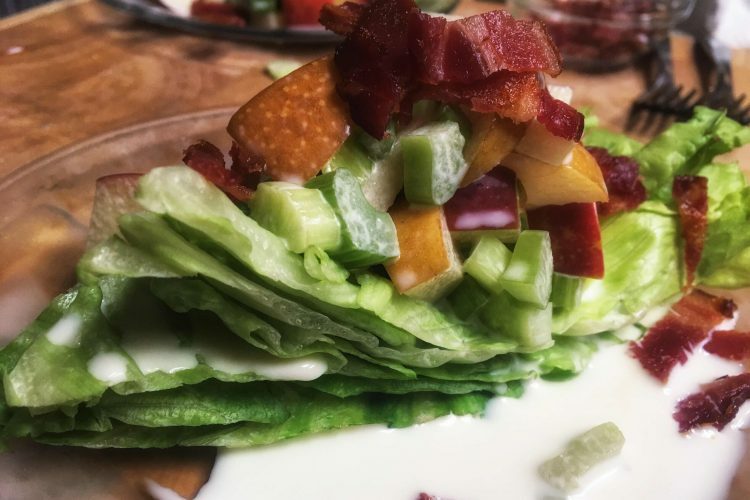 The apple mixture went atop the lettuce, followed by a drizzle of more dressing, and garnished with the bacon. At the table, we seasoned it with a touch of fresh cracked black pepper and pink Himalayan salt. A brightly festive salad, with a bit of salt and bit of sweet, with lots of crunch. If an iceberg wedge doesn’t suit your fancy, a blend of spinach and baby kale presents itself well as the base to the salad. To keep it vegetarian, toasted almond slices may be used atop the salad, instead of bacon. Cover and keep chilled in the refrigerator. Recipe may be doubled to accommodate larger parties.